Netflix's Use Of Train Disaster Video In 'Bird Box' Causes Uproar In 2013, an American-owned oil tanker train exploded in the Quebec city of Lac-Megantic and killed 47 people. Canadians are furious that video of the disaster is being used by Netflix in sci-fi films. The Netflix series Travelers uses video footage from an oil train disaster in Lac-Megantic, Quebec for its fictional series about time-travelers. The use of the footage has angered Canadians. Canadians are furious over Netflix's use of real-life footage of a deadly oil-train disaster in two of the company's recent science fiction productions. The 2013 accident in Lac-Megantic, Quebec, involved an American-owned oil tanker train and left 47 people dead. It incinerated the community's historic downtown — video images of towering pillars of smoke and fire went viral on Youtube. This winter, those images began appearing again on Canadian TV screens, not in newscasts or documentaries, but in sci-fi stories, including the hit alien invasion film Bird Box with Sandra Bullock. In the Bullock film, the Lac-Megantic images are part of a fake newscast that purports to show violent turmoil in Europe. The clip appears briefly again in Travelers, a joint U.S.-Canadian sci-fi series about time-travelers, repurposed in a fake newscast describing a nuclear attack on London. Lac-Megantic Mayor Julie Morin declined to speak with NPR, but provided a statement calling use of the video unethical. "Those images are the representation of our city's worst day in history, a day from which we are still working hard to recover," Morin wrote. She called for the film industry to reconsider the use of footage taken from "real tragic human events" for fictional entertainment. Canada's Parliament agrees. In late January, MP Pierre Mantel spoke on the floor of the House of Commons, denouncing Netflix and introducing a nonbinding resolution calling for the company to "compensate local residents and remove the video clip from the films." The proposal was approved unanimously and drew a round of applause in the chamber. 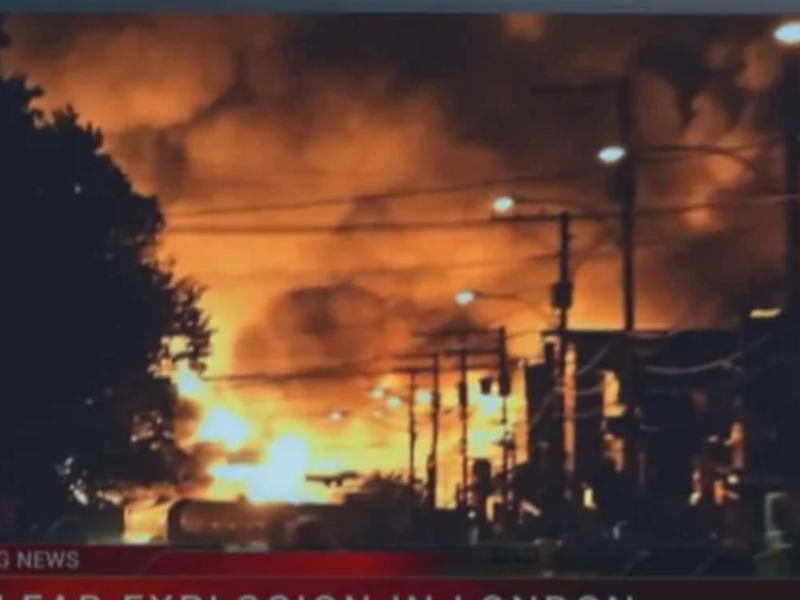 Some commentators in Canada have pointed out that stock footage of real disasters has been used by Hollywood in entertainment films for years. In an open letter addressed to the community of Lac-Megantic, Netflix executives wrote that they "regret any pain" their productions caused, but they haven't offered compensation. The stock film distribution company that sold the video clip also apologized and says it's reviewing its policy for how images can be repurposed by clients in the film industry. "It has recently come to our attention that our footage depicting the Lac-Mégantic rail disaster was taken out of context," said the firm Pond5 in a statement. "We deeply regret that this happened and sincerely apologize to anyone who was offended, especially the victims and their families," the company added. Producers of the Travelers sci-fi series now say the fiery images will be clipped out and replaced as soon as possible. Netflix is refusing to remove the footage from the film Bird Box.